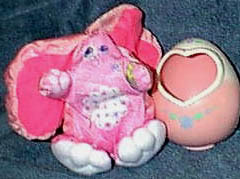 Description: Candy Bunny is a large Smooshee bunny rabbit from the 1989 Smooshees Easter Assortment. This bunny was sold with a Easter egg that she can be smooshed into. Designed for children ages 4 years and older. FPT16195 - Candy Bunny - Large Smooshees bunny rabbit with a pink body, long pink ears with dark pink inner ears, and a white tummy with pink, purple, and green designs on it. Candy has a white paw print on her right hand and a beautifully colored Easter egg in her left hand. She has a white ring around one eye, and a pink triangular nose. Measures 4" tall from bottom of feet to top of head. Ears measure 3-3/4" long each. Candy is larger than most Smooshee bunnies. 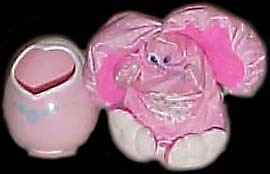 FPT16196 - Pink plastic Easter egg with a white top and a heart-shaped opening on the side that Candy Bunny can be smoosheed into. The egg has a blue flower and green leaves above and below the heart-shaped opening. Marked "©1988 Fisher-Price, Made In China" on the back. Measures 3-1/4" tall, 2-1/2" wide, 2-1/2" deep. This set was sold in a 8-1/2" long, 7" high, 3" deep display box. This set was also sold in #7315 Smooshees Easter Assortment.